Alongside the unveiling of its much-anticipated P30 flagship lineup, Huawei has pulled a fast one on everyone with the launching of its smart glasses at its Paris event. Yes, you heard me right. Huawei has partnered with Korean eyewear brand Gentle Monster to debut its first-ever smart eyewear product. These glasses don’t come integrated with a camera up-front, which basically means they aren’t designed to capture moments around you. 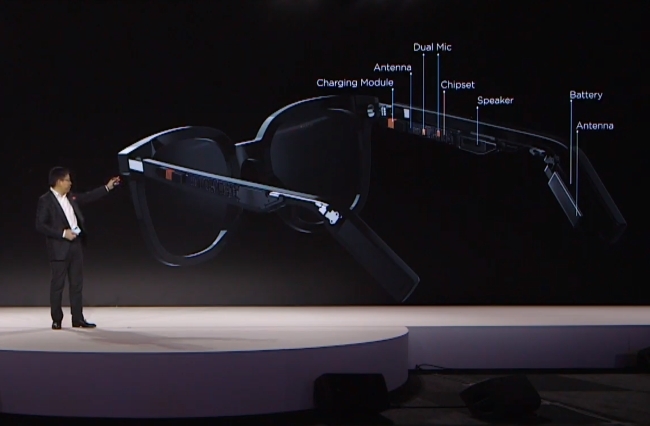 Instead, Huawei’s smart glasses come baked with electronics which make it an earbuds replacement. There’s a dual-microphone in the side of the glasses, which utilizes beam-forming technology and AI for noise reduction and crisper audio calling even in crowded locations. It also offers a stereo sound experience with the inclusion of “dual semi-open speakers” that are positioned precisely to avoid sound leaks. The smart glasses boast a clean and minimal design, which is obviously customizable to your style choices. There are no ports and buttons anywhere around the device, but you have touchpads one either side to answer calls and bring up your AI smart assistant to tell you about the weather, traffic, and appointment updates. Since there are no ports / openings on board, Huawei’s innovative smart glasses charge via its carrying case and it uses NFC contactless wireless charging — the world’s first as boasted by the company. Huawei hasn’t revealed any pricing information for its smart glasses, but it’s expected to become available from July later this year.